Sometimes, the only way to beat the heat in the New Mexican desert is by sipping on a cold and creamy milkshake! The perfect sweet treat, you’ll find some of the very best milkshakes throughout New Mexico. 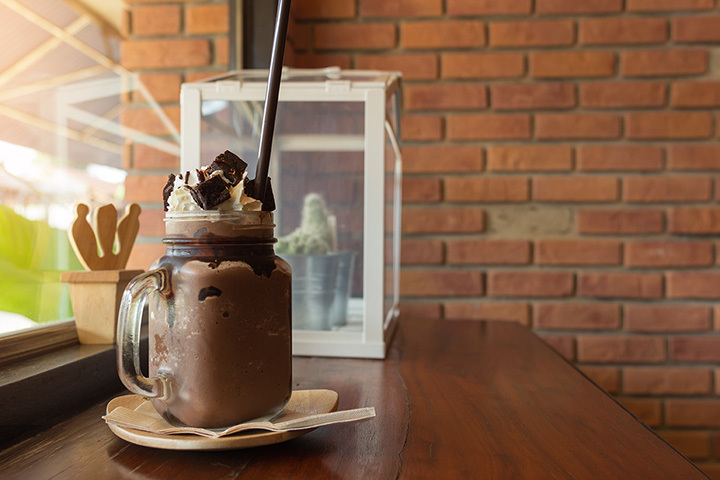 From traditional to contemporary, check out these 10 spots for a delicious milkshake in the state! Milkshakes hit their heyday in the 1950s at the neighborhood burger joint or diner. This place is a step back to that time. A one-time gas station now houses this vintage-style burger stand that serves thick, creamy Adobe Mud Shakes made with the famed, organic Taos Cow Ice Cream. You could just get a vanilla shake or … you could take a walk on the wild side and try the lavender or piñon caramel or Mexican chocolate. Have them toss on a few piñon nuts for some southwest flair. You’ll need both a spoon and straw to get every last bit of from the bottom of the glass. Take a friend and ask for two straws when you order one of the frosty, velvety thick made-to-order shakes. It comes served in a traditional fluted glass with the extra in a stainless steel cup—more than enough for two. Sit at the counter of this 50s-style diner, shaped like a giant owl with its big eyes keeping watch on the antics below, and choose from inventive combinations like the Chunky Monkey, banana with chunks of brownies or the Holy Grail, peanut butter and Oreos. All begin with delicious Blue Bunny vanilla ice cream. 1950s diners aren’t the only places to get milkshakes, but they’re the best because they make them the old-fashioned way: hand-dipped with real ice cream—that’s how it happens at Penny’s. This all-night diner is part of the Oak Tree Inn franchise. It’s retro, shiny and bright and you can get a made-from-scratch shake that comes with two scoops of ice cream, blended with real milk and topped with a crown of whipped cream … and a cherry! For more than 30 years, this car-hop drive-in has been awarded the title of “Best Cheeseburger” on the Green Chile Cheeseburger Trail. But what would a cheeseburger meal be without a milkshake? Incomplete. It’s a good thing you’ll find a delicious selection of handmade shakes here that range in flavors from pineapple to butterscotch to cherry to chocolate, vanilla and strawberry. Sit outside under the covered patio, inside at the tiny counter or get car-hop service. Shakes come in slurp proof Styrofoam cups with lids so you can drink them on the go. The red-and-white store front here is reminiscent of a turn-of-the-century ice cream store that promised mouthwatering treats. It doesn’t disappoint. The soft-serve ice cream milkshakes come in chocolate and vanilla or blend those two flavors together for a twisted delight. Even in the cold, high mountain air, a shake hits the spot after a day of adventure. A great milkshake is all about the base and that means handmade ice cream made with whole milk, real cream, fresh cage-free eggs and cane sugar. That’s what you get here. They come served in a classic stainless steel mixer cup, accompanied by a chilled glass. Real vanilla beans give the vanilla ice cream a boost of flavor in the straight-up vanilla shake. Other favorites include strawberry, espresso and red velvet. A super cool American style retro diner with 21st century flair. Since 1907, Blue Bell Ice Cream has been a part of southwest dessert culture, distributing its product to select states like New Mexico. It’s consistently named as one of the top five ice cream makers in the country. This excellence is what you’ll find at the heart of the milkshakes here. Shakes are made just like they were when first created, hand-scooped ice cream into the blender with milk and any extra flavors. Pick your indulgence: small, medium or large. A guajillo chile mango shake? Green chile shake? Sassy Strawberry with guajillo chile? Who would put those flavors together? The imaginative owners of Sparky’s who have been creating exceptional food here for more than 20 years. Also on the menu are standard shakes like vanilla and chocolate, plus some walk-on-the-wild-side shakes with bonuses like Oreo pieces or Reese’s candy. Specialty shakes are made with soft-serve vanilla ice cream. All come topped with whipped cream and sprinkles! If you’ve got a dream in your heart for a milkshake that begins with hand-made ice cream then this is the place for you. This 50s-themed diner is locally owned and operated and the quality of fare is a priority—thus, ice cream is made on the premises by the owner; and you can choose from 30 flavors: Bavarian black cherry, pralines and caramel, orange sherbet and Durango Joe mocha are standouts. Shakes are blended and capped with whipped cream and a cherry. Grab a straw and a spoon and dig in.